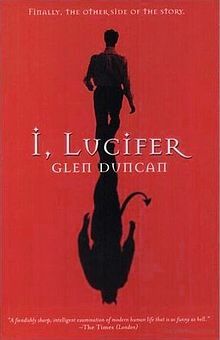 I remember that I read I, Lucifer as a teenager, but honestly my recollection of it wasn't especially clear. So I decided to take a re-read of it to see if it I could remember more as I went along, and to see if my mixed opinion of it had changed. I, Lucifer focuses primarily on, you guessed it, Lucifer. Fallen angel and Heaven's Enemy Number 1. The novel starts when Gabriel is sent to offer him a deal from God: if he can live a virtuous life as a human, then he can earn the chance for redemption and being accepted back into God's good graces. He manages to reach a compromise where he has a month's try before you buy period, for lack of a better term. One month to see what being human is truly like. Having no intention of taking up God's offer permanently, he takes up residence in the body of an author, Declan Gunn, who was midway through a suicide attempt and decides to use his new body's status to tell his side of history. And in the process, he comes to understand how humanity works. I'm still mixed about I, Lucifer. On the one hand, Duncan's grasp of how Lucifer would present himself is startlingly convincing, with just that right balance of charm, ribald humour and unrepentant immorality. And it does take an interesting look at where freedom and free will sits when you assume that God has an overarching plan for the universe. There are several points in the narrative that are incredibly entertaining and/or thought-provoking and that's always a plus in my books. On the other hand though, there isn't really much story going on. 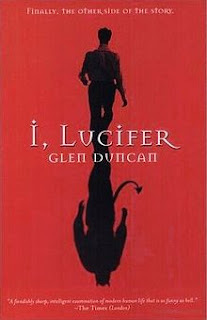 Lucifer takes over Gunn's body, has a few sensory overload moments, then the book pretty much sticks to drug-fuelled debauchery right up until the last thirty pages. I don't know about you, but I find the whole drugs and alcohol, Hollywood debasing itself thing to be really boring. In small doses, yeah, it can add some tension to a novel. But for a large chunk of a 260 page novel? It just starts to drag and it makes you wonder whether the Devil would really be quite so obvious. The parts where he was exploring the senses, taking inordinate pleasure in 99 ice-creams, getting overwhelmed by the range of colour in flowers, that I liked. The hookers and blow? It was cliche and went on way too long. I mean, kudos for including the negative consequences of it in a kind of matter-of-fact way, but still.